Naomi Loomis considers the British Virgin Islands to be her favorite vacation destination, and her next visit to this overseas territory will be her 14th! Naomi Loomis (right) and her family enjoy a meal at The Crawl Pub, in Virgin Gorda’s Bitter End Yacht Club. The British Virgin Islands are located in the Caribbean to the east of Puerto Rico and includes more than fifty islands. Only fifteen of the smaller islands and cays within this archipelago are inhabited. The main islands in this territory are Tortola, Virgin Gorda, Anegada, and Jost Van Dyke. As the largest and most populated of the islands, Tortola is home to 23,908 people. This 13.5 mile x 3 mile was formed by volcanic activity and is known today for being full of mountains. Tortola is also near a fault line, so minor earthquakes in the area are common. Popular attractions include the beaches on the Northern coast of the islands, which offer room for sailing, surfing, scuba diving, and hiking. Naomi Loomis especially enjoys sailing and chartering boats with her husband. Virgin Gorda is the second most populated island and third largest in size. The island’s name is actually Spanish for “The Fat Virgin”, a name Christopher Columbus supposedly gave to the island after observing that the island’s profile resembled a fat woman lying on her side. Popular destinations include the five-star resort “Bitter End Yacht Club”, an old copper mine, and a geologic formation known as The Baths. The northernmost island, Anegada is the only inhabited island made from limestone and coral instead of volcanic activity. It is also the second largest island, though its population includes only 200 people. On a typical day, the island attracts another 200 tourists, who mostly come for fishing or to see the Horseshoe Reef. Jost Van Dyke is the smallest of the four main islands and is also known for being mountainous and volcanic in origin. Great Harbor is one of the major vacation destinations for tourists. Roughly 7,000 boats pass through the island’s port each year, with many stopping to explore the area’s shops, bars, and restaurants. 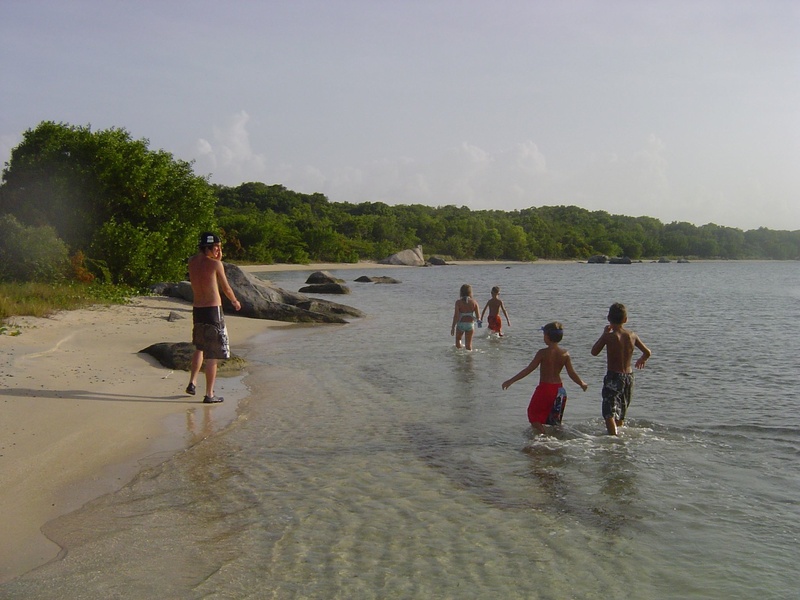 During a recent trip, Naomi’s kids enjoy some time on the beach in the British Virgin Islands.